‘What a day to be out on the hills!’ I berated myself as we began our ascent up the steep western slope of Rocky Mountain. The BBC weather forecast for Sunday was a work of pure fiction – what sunny intervals?! The day was indeed grim, gusty wind sending huge veils of rain pulsating over a landscape grey, dull and uninviting beneath impenetrable white cloud. My Paclite jacket clung to my arms as if my body had been vacuum-packed inside it. We spied a miserable knot of GoreTex clad walkers set out from the Leitrim Lodge car park, but that was the last we saw of anyone all day. Atop Rocky Mountain it was difficult to remain upright as the wind did its worst, one small consolation being that the rain had turned to mizzle. We did not tarry long, heading south on a trail that had become a rivulet, amazed at the volume of water cascading off saturated peat hags nearby. Amid the swirling mist from a broad platform of granite at Pierces Castle, intriguing vistas flashed before us to be snatched quickly from view: rugged tors, angular slopes, hulks of mountains near and far, a serpentine river far below. Over Hilltown, a watery rainbow shimmered momentarily only to be swallowed in the gloom. Castle Bog then lay in wait: a ghastly other worldly place of drifting mist, brackish water and floating mats of moss that swallowed all semblance of the track we were following. Even the bog cotton had given up the ghost here, trailing sodden heads tinged with green slime. Thank goodness for map, compass and GPS, for in such conditions this place could be a truly terrifying experience. We squelched and sloshed our way to the foot of Shanlieve to follow Batts Wall upwards. An eerie silence fell as wraithlike mist enveloped us and great monoliths and jagged lumps of granite appeared in the gloom as we scrambled our way upwards, the only sound my laboured breathing as my body sweated and strained under layers of GoreTex. Near the summit, the wind returned with a vengeance almost ripping the clothes from our bodies and continued to brutally buffet us as we headed towards Eagle’s summit. We scurried for shelter behind Batts Wall where we passed a barely tolerable 15 minutes to eat our lunch. The wall provided scant cover as we descended towards Windy Gap where another lung bursting climb lay ahead to conquer Slievemoughanmore. Darkening cloud encroaching from the west promising heavy rain prompted us to seek lower ground, so we followed the Rowan Tree River on saturated, slippery ground, picking up a gravel track that ran alongside the Rocky River beneath the rugged tors of Hen Mountain. A brisk walk up the Sandbank Road took us back to the now near deserted car park at Lietrim Lodge after a 16km walk and over 1,000m of ascent. 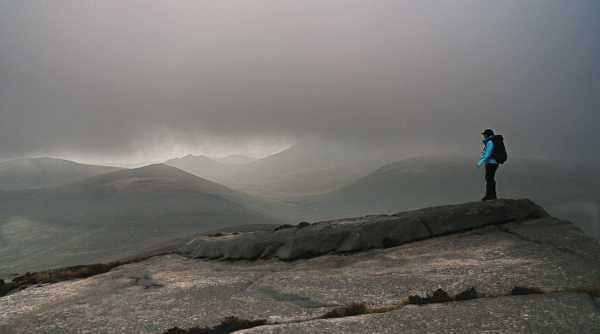 Far from mourning the lack of views, the fleeting glimpses through the mist of an enchanting landscape engendered a sense of intrigue that served to galvanise our desire to return to explore this section of the Mournes.